Ready for Spring in January? All those in favor say “aye”. ~ by jacquiephelan on January 24, 2011. The temperature is getting spring-like in the Northwest, making me really want the real thing! Is that photoshop sepia or the patina of age? 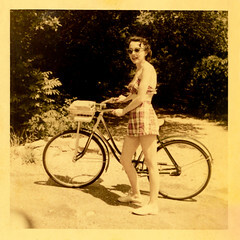 That pic makes me actually want to ride my ’53 Schwinn Debutante. Also the fact that I haven’t rode the Deb’ in about three years, so I have almost blocked the horrors of the last time from my mind. But yes, yes, yessss, I am ready for springtime and how! I was pondering starting seeds for the garden just earlier this evening.